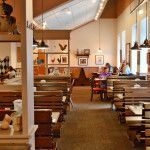 Schaumburg Egg Harbor Café - Fresh, Local Breakfast, Brunch and Lunch. Egg Harbor Cafe in Schaumburg offers great service and flavorful breakfast and lunch creations in a beautiful, light-filled space. Intelligentsia coffee freshly brewed and brought to your table in a carafe. Made-to-order blended beverages from our espresso bar. Efficient, friendly service for business diners. Creative daily specials. A children’s menu and coloring contest for families. A gluten free menu with amazing gluten free pancakes and cinnamon rolls from Sweet Ali’s Gluten Free Bakery. Authentic stone-ground grits from Allen Brothers Milling Company. Many fresh, healthy options from locally owned and operated businesses. Delicious catering fare perfect for gatherings of any size.